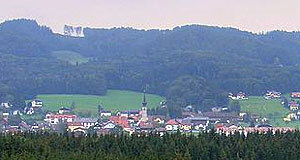 Nussdorf is a town in the northern part of the Flachgau region. It has a population of approximately 2,300 and is situated at the base of the Haunsberg hill. Nussdorf is a tad too far from Salzburg to be much of a commuter′s town, which has helped the place to preserve its village atmosphere. It has very few attractions to offer - the obligatory parish church, a few nice farmhouses, but nothing to shout about. International tourists are unlikely to make it there. One thing worth noting is the abundance of fossils in the area around Nussdorf for those with palaeontological interests. An important excavation site for fossils is the Kroisbach or Kroisbachgraben. This is a gorge along which plenty of fossilised marine ex-life can be found, including shark′s teeth. The Kroisbachgraben is a geological site of European-wide significance. The fossils date back to an era between approximately 60 and 65 million years. Note that there is a "Geo Pfad", a theme hiking path with plates and labels that point out things of interest. It is a very popular hike and easy enough to do even with children (who tend to be dinosaur enthusiasts anyway). If you don′t have your own mean of transport, Nussdorf is accessible by bus - but note that the Koisbachgraben is outside the actual village, so driving yourself is highly recommended. It is considered to be part of the Salzburger Seenland (Salzburg Lake District).